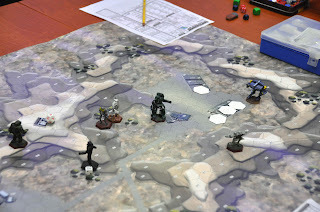 Last Saturday I went to the Ducosim games convention in Amersfoort and played a small Classic Battletech game with Michiel and Marnix. Marnix and myself represented a Clan invading force who had to destroy and capture several IS buildings. I went over there with a combined star of mechs and elementals not fully realising I would be using just 1/3rd of my force. That had been stated in the mission scenario but I did not fully comprehend what it meant for the game. I ended up using just my Summoner in support of Marnix's Locust IIc and another second-line mech whose name I forgot. We decided that we would try to divide Michiels force of 5 mechs by sending all 3 of our mechs on a different route and this worked fine until Michiel realised what was happening and in true Innersphere surrat style focussed all his fire on my Summoner who held on for about 4 turns under humongous incoming ordnance before succumbing and the pilot ejecting. A brave last stand... where's the cavalry when you need them? Oh forgot: always late! Well we had a blast (pun intended) and since this was the start of a mini-campaign of sorts, you can expect to see more here.